Clementine Ford reports that one of the questions she is most asked in person and online is ‘How do I raise my son to be a feminist? How do I make sure he’s a supporter rather than a perpetrator?’ That is a question that many parents with sons are haunted by. Now that Clem is mother to a baby boy of her own, it is a question that haunts her too. How does a feminist raise a son in a world that conditions boys into entitlement, privilege and power at the expense not just of girls' humanity but also their own? All boys start innocent but by the time they are adolescents many of them will subscribe to a view of masculinity that is openly contemptuous of women and girls. This explosive new work will look at toxic masculinity and the closed ranks of brotherhood that shape an entitled, disrespectful and potentially dangerous idea of manhood. 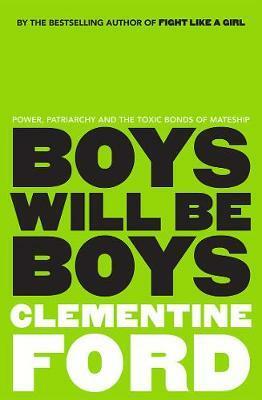 In Boys Will Be Boys, bestselling and ground-breaking author of Fight Like a Girl, Clementine Ford, dismantles the age-old idea that entitlement, aggression and toxicity are natural realms for boys, and reveals how the patriarchy we live in is as harmful to boys and men as it is to women and girls. Just as she did with the title of her first book, Clementine Ford has taken another well-known expression and repurposed it for the title of her second. Ford reclaimed Fight Like A Girl and framed the idea as a positive; with Boys Will Be Boys Ford challenges the assumed and oft-quoted wisdom of that idiom. In making the case that many of the current prevailing notions of masculinity are deeply problematic, Ford stipulates that the issues of toxic masculinity are cultural, not biological. Yet, as any regular reader of Ford’s Fairfax columns would expect, this is not a book that sets out to make excuses for unacceptable behaviour. And thank goodness it’s not – at the time of going to press, less than a year after the Harvey Weinstein revelations and the advent of #MeToo, the backlash against those who spoke out, and continue to speak out, is rife, and ample space and support is being given to this backlash by reputable media. Ford demands better than this for, and from, everyone: for all people, of all ages, across the gender spectrum who are imbibing insidious and overt cultural messages every day about who they are, who they should be, and how they should interact with others. Example after example lands like punch after punch of how our limited and rigorously policed notions of masculinity are causing harm to all. While she is under no illusions about the immense privileges patriarchy affords men, Ford is just as concerned by the harms it inflicts upon them – particularly while they are growing up – as she is about the damage it indubitably does to women. Boys Will Be Boys is an impassioned call for societal change from a writer who has become a stand-out voice of her generation (and has the trolls to prove it) and an act of devotion from a mother to her son.